Perform a variety of 4D STEM experiments, including strain mapping, indexing, orientation mapping, virtual apertures, and differential phase contrast. 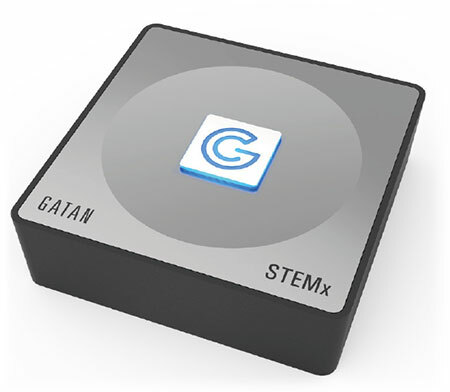 The STEMx collects data through hardware synchronisation with Gatan in-situ cameras, to add 4D STEM diffraction to your toolbox. Once a diffraction pattern is generated for each data point, you can view and manipulate all information from a 4D STEM diffraction cube using a single display. This includes diffraction planes and individual diffraction patterns for each pixel. STEMx processes large datasets in minutes, using data size reduction methods that include binning in four dimensions, sub-sampling the spatial domain and selecting small regions of interest. With both acquisition and analysis in a single software display, you can analyse and assess results quickly at the microscope. Decide straight away whether to modify acquisition parameters or capture a completely new dataset. Get the most out of your information-rich 4D data sets with integrated analysis tools. Calculate high-resolution strain maps with a reference diffraction pattern (DP) automatically generated from an unstrained area of the sample. This is then compared to all diffraction images in the dataset. 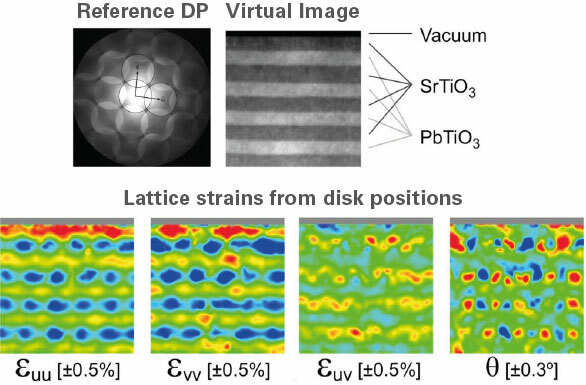 This enables you to evaluate dimensional changes in a crystal lattice to understand material growth and structural integrity. Generate unique virtual aperture images from distinct reflections in the data set. Simply select a reflection with a region of arbitrary shape, then combine the virtual apertures from one or more reflections. By overlaying images, you can study grain orientation from actual or theoretical constructs. You can also predict their impact on the material’s electrical and thermal conductivity. Virtual aperture workflow: (a) Highlight a reflection with a virtual aperture of arbitrary shape; (b) Reconstruct a diffraction image using that virtual aperture; (c) Generate an RGB overlay from several apertures,eg to highlight grain orientation. This dataset was collected with the OneView IS camera using a copper foil sample. Courtesy of Dr. Geiss, Colorado State University. When combined with spectrum imaging, STEMx also enables you to spatially resolve the distribution of diffraction patterns relative to electron energy loss spectroscopy or cathodoluminescence data. You can then create a comprehensive dataset that includes qualitative compositional or chemical maps and profiles.